Metal UN Containers - Bargain batch alert! Due to an unexpected manufacturing over-run, the H&O Plastics warehouse is full to the brim with Crimped Lid Metal UN Containers which we need to shift as quickly as possible. To sell this surplus we have slashed the container price and plan to sell them in batches of 121 on the Buy Buckets website. These containers are fully compliant with UN container specifications, meaning they are safe for national and international transit. The discounted batches of 121 units will appeal to those transporting large quantities of harmful or polluting materials across national borders. The batch price of £266.20 equates to a unit price of £2.20 per container, a significant cost saving for exporters who need to use metal buckets. Pick up a bargain today. 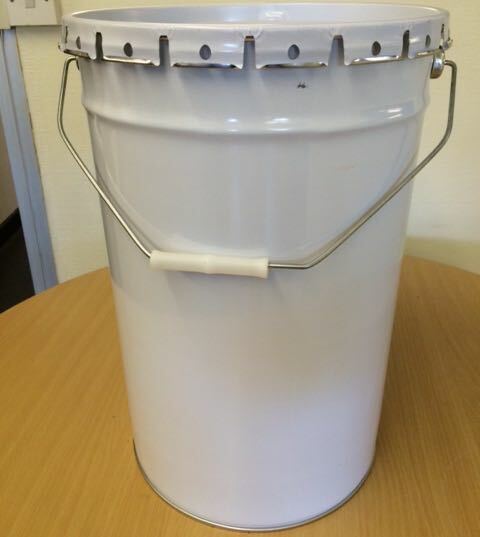 Our range of UN certified metal pails are manufactured from high quality raw materials sourced responsibly from H&O approved suppliers. The discounted containers all come with a crimped lid to ensure an air tight seal. These 121 batches are perfect for storing, transporting and decanting liquids with ‘aggressive’ properties. The metal will not corrode under abrasive conditions and the seal-shut lids ensure that no liquid will escape during transit. Buy discounted metal container batches today.